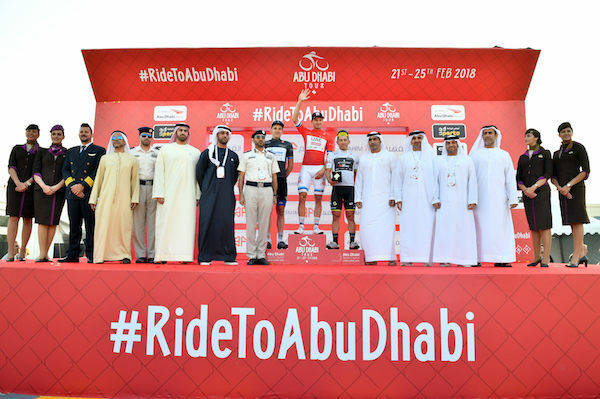 Madinat Zayed, 21 February 2018 – Alexander Kristoff claimed his second victory for UAE Team Emirates today as he kept his momentum rolling after winning the conclusive stage of the Tour of Oman on Sunday. In the long final straight in Madinat Zayed, he outsprinted Caleb Ewan (Mitchelton-Scott) who launched from far out despite the headwind. The Australian took third place and the best young rider jersey while Andrea Guardini (Bardiani CSF) – the very first stage winner of the Abu Dhabi Tour back in 2015, also in Madinat Zayed – settled for second. Mark Cavendish (Dimension Data) crashed out as he was involved in a fall in the neutralized zone. 2 - Andrea Guardini (Bardiani CSF) s.t. 3 - Caleb Ewan (Mitchelton - Scott) s.t. 2 - Andrea Guardini (Bardiani CSF) at 4"
3 - Caleb Ewan (Mitchelton - Scott) at 6"
The route of Stage 2 is predominantly through in the eastern part of the city. 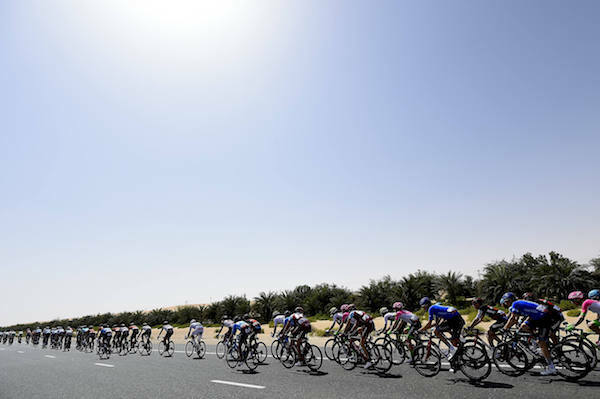 After the start, it runs to Al Rahba, then Khalifa Port, where the first intermediate sprint is located. 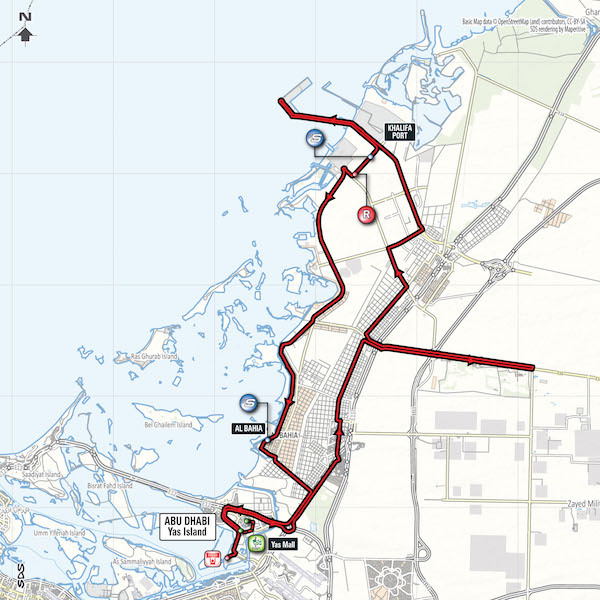 Then, still on wide and straight roads, it goes through Al Bahya (second intermediate sprint) before returning to Yas Island. The whole course is on wide roads but riders must pay attention to the cat's eyes that divide the lanes. The final 5km is all on a wide road with broader bends leading to the asphalted finish line. The last curve is with 750m to go. Yas Mall is the capital’s biggest and the UAE’s second largest shopping centre, with a variety of unique and exclusive stores. With over 1,700 animals, including a majestic pair of white tigers, a 32-year old, 300kg Siberian bear, lions, cheetahs and dozens of zebras housed in the zoo’s ‘Predators’ and ‘Wild Animals’ enclosures, the Emirates Park Zoo in Al Bahia, a north-east suburb of the UAE capital features a park-wide ‘misting system’ which keeps animals and patrons cool in the summer months. Connected to the zoo, the Emirates Park Resort features air-conditioned accommodation with balconies overlooking the zoo, cave or garden. Located in Taweelah, midway between Dubai and Abu Dhabi, deep water Khalifa Port is the first semi-automated container port in the region, and one of the most efficient and technologically advanced in the world. Its state-of-the-art infrastructure allows the handling of all of Abu Dhabi’s container traffic, with the ability to serve the largest ships at sea, with flexibility for future expansion. Since the launch in 2010 and signing the first Musataha agreement in 2011 to having 14.1 million square metres of land leased in 2016, Khalifa Industrial Zone Abu Dhabi (KIZAD) has steadily proven its unique value to investors looking for outstanding access to markets via excellent transport networks, facilitated by the adjacent Khalifa Port and connections to major air, sea, and future rail. An emerging entertainment destination just a 30-minute drive from downtown Abu Dhabi, Yas Island is home to the state-of-the-art Yas Marina Circuit – host to the annual F1™ Etihad Airways Abu Dhabi Grand Prix. Set on Yas Island’s tranquil southern shores, Yas Beach is the island’s only stretch of beach. Open daily from 10am – 7pm, it is a great spot to relax and enjoy sun, sea, sand, food and drinks. Set to open in 2018 on Yas Island, Warner Bros. World Abu Dhabi will feature six immersive lands making a one-of-a-kind, world-class destination and home to 29 state-of-the-art thrill rides, and interactive family friendly attractions. Yas Waterworld is home to 43 rides, slides and attractions, including the 238-metre long, world’s first, and largest hydromagnetic-powered, six-person tornado waterslide. A full day experience, the park draws on Abu Dhabi’s heritage and has ‘The Lost Pearl’ as its theme. It also features a souk, pearl-diving exhibits and restaurants. It’s fast and furious fun for all ages at Ferrari World Abu Dhabi - the world’s first Ferrari-branded theme park. The park tells the Ferrari story with passion and excitement through more than 20 exhilarating and educational rides and attractions, interactive shopping and authentic Italian dining experiences. This unique five-star hotel is set half on land and half on water, overlooking the F1 circuit. Its covering, a 219m expanse of sweeping steel and glass panels, provides a veil draped over the two hotel towers, linked by a bridge that crosses the racetrack. The lighting system, comprising more than 5,000 diamond-shaped glass panels, changes colour through cable TV screens and creates a stunning optical effect. Host to the annual F1™ Etihad Airways Abu Dhabi Grand Prix, the Yas Marina Circuit offers a series of track day driving packages. At the circuit’s center piece is Yas Viceroy Abu Dhabi, a five star, iconic hotel – the only one in the world to straddle an F1 race track, being breathtakingly built half on land and half over water. Attracting Super Yachts from as far away as Australia for the annual F1™ Etihad Airways Abu Dhabi Grand Prix, the Yas Marina is central to Abu Dhabi’s ambitions of becoming a strong rival to traditional yachting grounds such as the Mediterranean and Caribbean. On the west shores of Yas Island, Yas Links Abu Dhabi – an award-winning golf course, designed by Kyle Phillips, one of the world's leading golf course architects - is in line with the traditional links golf commonly associated with the coastal towns of Scotland and Ireland. Voted among the 'Top 10 New International Golf Courses' by the influential US publication Golf Magazine, Yas Links features a 7,450 yard par 72 course, utilizing five teeing grounds per hole, with all 18 benefiting from ocean views. Recently Yas Links has also been named one of the world’s top 25 by influential US magazine, Golf Digest. Set on a majestic stretch of white sand, and easily connected to all of the island’s diverse leisure activities, this laid- back beach is a blissful new development on the emirate’s entertainment district. Sun seekers holidaying at any of Yas Island’s seven hotels and hotel apartments can now enjoy complimentary access to Yas Beach.